I was in New York about three weeks before I ventured down to Chelsea. You might ask, “What took you so long?” All I can reply is Christ knows, I suppose I was distracted. New York has a way of doing that. The city boasts an extraordinary quality whereby it makes the first-time visitor to the city gush with nostalgia. Its role as perhaps the most famous city in the world makes it both alien and familiar to the global punter. New York’s attraction may just come from this oxymoronic duality. Being the cultural capital of the world’s premier capitalist society, it shouldn’t surprise you that inequity snakes it way through the city rather obviously. By this stage I’ve grown tired of commenting on this feature of the city from a political or social perspective. However, from a purely aesthetic or architectural point of view it is interesting to note the implications of this facet of the city on its buildings and streets. The Upper Eastside is predictably grand and impressive but is sandwiched between a rather scrappy Midtown and the noticeably poorer Harlem. The East Village occupies that strange space whereby one side of Bowery (a major vein of Manhattan) boasts cobbled streets that divide trendy gallery spaces from hip cafes, whilst the other side supports crumbling Edwardian homeless shelters, its broken contents littering the cracked footpaths. Chelsea is unusual by New York standards because it’s universally beautiful. Its cobbled streets flanked by impeccably kept three-story redbrick townhouses and mature leafy elms stretch out uninterrupted by busy bodegas. Working on the Lower East Side, I found myself being drawn to the West Village every evening after work. To replace the frantic scrappiness of Bowery with the simple, solid visual splendour of Chelsea felt right. It was a necessary detox for the spirit and I felt revitalised as I ambled through its streets and avenues. The High Line, located between Chelsea’s Gansevoort Street and 20th Street, quickly became the final destination of my evening strolls. Originally built in the 1930s as a means to elevate dangerous freight trains from the bustling streets below, it fell into disrepair in the 1960s. Nature soon claimed the High Line, resulting in the rather surreal, self-sown aerial meadow, which stretches down through Chelsea. Man recolonised this urban meadow by constructing the High Line Park, which opened in June 2009. 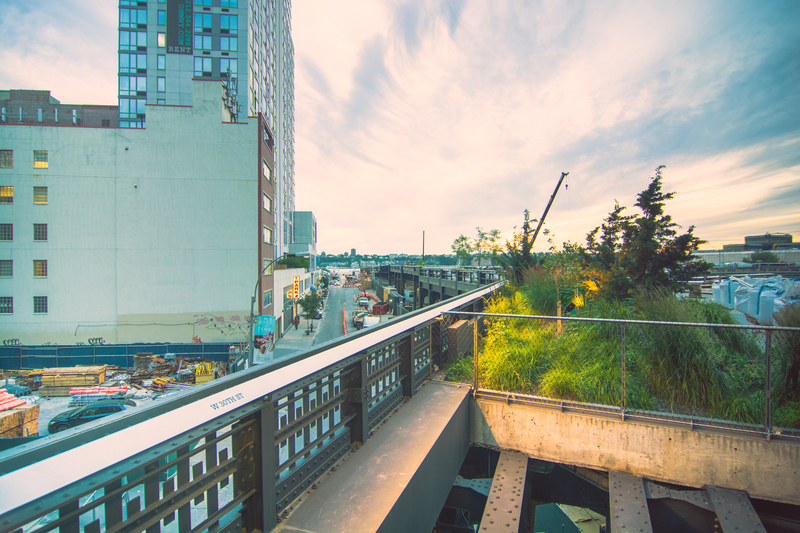 Its architects, Diller Scofidio + Renfro, managed to design and build an urban aerial park that was sympathetic to both the High Line’s original history and its more recent reclamation. By including infrequent glimpses of the original tracks in the path alongside the wispy, leafy plants that ape the meadow of the 1980s, the architects managed to reference the High Line’s history whilst creating something new and fresh that complimented its Chelsea surroundings. New York is a spectacular city and I draw on the most basic meaning of that word when I say this. It is a spectacle, striking and moving. It is not always pretty but is always impressive; Chelsea is its great beauty spot and the High Line, its gem.